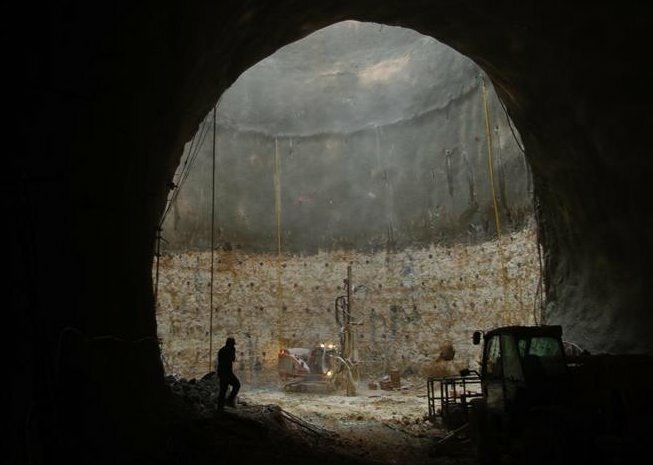 Hebrew University of Jerusalem researchers have conducted an initial survey of what appears to be an important, ancient water source in a cave that was been discovered during excavation work for a new train station being constructed at the entrance to Jerusalem. The work was done by members of the Cave Research Unit of the university, headed by Prof. Amos Frumkin of the Department of Geography. The cave was exposed near the base of a deep service shaft that was dug for the train tunnel leading into the new station, located opposite the main bus station in Jerusalem. The full length of the cave is as yet unexplored. The cave is narrow and a few dozen meters high, forming an underground canyon. It contains an underground stream, flowing in a southeasterly direction. It is a type of karstic cave, which refers to an area of limestone in which dissolution has produced sinkholes, underground streams and caverns. Karstic caves are common mainly where the climate is wetter, such as Slovenia. The length of the cave is believed to extend for several hundred meters, at least, though its true length will only be known after subsequent explorations. At a distance of some 200 meters from the service shaft, the Hebrew University cave explorers found a series of small waterfalls. Testing of the water in the cave, it is believed, can yield valuable information about potential pollution of the underground water supply in the Jerusalem area. "This cave is the largest and most impressive of its type that has yet been found in Israel," said Frumkin. He pointed out that the cave is situated in an area about which there is uncertainty regarding the direction of the flow of water in the mountain aquifer, and this cave can assist in achieving a better understanding of that phenomenon. Frumkin cited the law that requires preservation of the cave for future generations, but said that this should be feasible for the most part without harming the work on the construction of the new train station.